Profit by Investing in Real Estate Tax Liens, the only tax lien book written by a tax lien investor, has been the top-selling tax lien book since its first release in November, 2004. 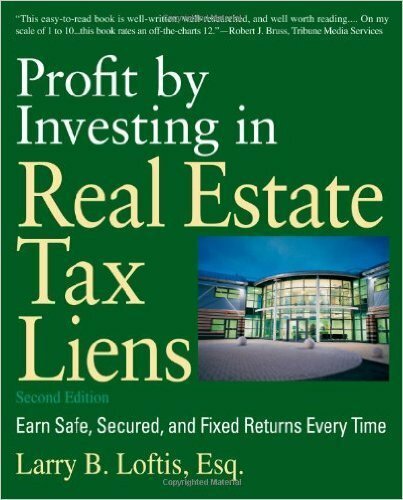 In this second edition, attorney and tax lien investor Larry Loftis not only teaches how to invest invest in tax liens and tax deeds, he provides insightful, first-hand experience from his purchases around the United States. Having purchased millions of dollars of liens (and deeds) in 12 states and attended auctions in 5 additional states, Mr. Loftis provides stories from different locations around the country, giving tips on how to avoid risks, and how to beat the competition. He provides technical knowledge that only an attorney can provide, as well as "tricks-of-the-trade" that only a seasoned investor can provide. Profit by Investing in Real Estate Tax Liens also debunks the common myth that tax liens are found only on run-down properties, and shows that liens exist on every type of property. Author Loftis, who has purchased liens on properties owned by famous athletes like NBA stars and world champion boxers, national banks (like Chase Manhattan Bank and LaSalle National Bank), and even a building whose major tenant was the local sheriff's department, reveals that he has seen liens on properties owned by a 9-time Wimbledon champion, a 3-time Masters champion, a Cy Young and World Series winner, a movie icon, an international celebrity athlete/model, and even properties owned by cities, the U.S. Post Office, and even the U.S. government! * What states are lien states and what states are deed states, and how do they work? * What about the "hybrid" (as Loftis calls them) states like Texas and Georgia? * How does an investor go about bidding at tax sales? And what is the due diligence required? * What are the different requirements in each state? * Where are the risks in this type of investing, and how do I avoid them? * How long do I have to wait to get paid off, and what rate of return can I expect? * How are counties selling liens and deeds using internet auctions, and how do I start?